Sometimes, you hear some line in a song and you think, “damn, boy”. Now, I was driving home from a gig the other night, in the cold and wet of the English spring, and “Best Of The Worst Kind” was playing. Towards its end, there are a couple of “damn, boy” moments. When those words hit me at the lights, it’s the bolt of lightning that has you penning resignation letters to your boss and texting whoever it is that you have something desperate to tell – ok, I still have the job and I don’t think I did anything particularly stupid with the other thing, but still. 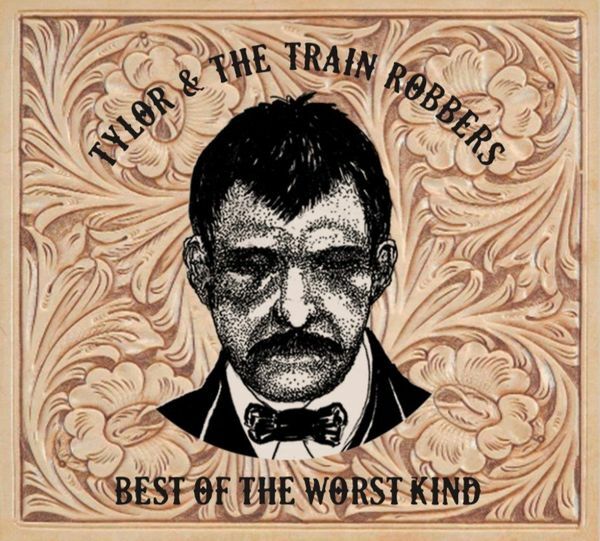 Flippancy aside, those two and the rest of the quite brilliant “Best Of The Worst Kind” are reasons why Tylor And The Train Robbers have caused such a buzz in the town in Idaho they call home and beyond. “Storyteller” is another that comes straight out of the top draw. Lap steel adds a real heartland feel but the lyrics…..man…..there won’t be a dry eye in the house amongst those that miss their grandad, it is gorgeous and heartfelt. Moreover, it is exactly what this type of band should be about. It is actually evident from the start that this is as good as Americana music gets. “Lost And Lonely Miles” has hints of the songs that Mike Cooley sings in Drive By Truckers, while you can imagine Steve Earle singing “Before It’s Too Late” in one of his more sentimental moments. It’s the little touches that make “…Kind” so superb. “Good At Bad News” is an old time country shuffle, but it is for the working class dreamers who’s only plan is to win the lottery – and there is a working class feel about the band throughout. Not surprising really considering they play 200+ shows a year and don’t have a manager. “Still Getting High” has some fine guitar from Johnny “Shoes” Pisano, but its anti-religion message is at odds with many in this sort of music. But then, well maybe Tylor and his brother Jason Bushman on bass, have always been outsiders. Outlaws you might say. Tylor’s surname is Ketchum. He is a distant relative of the infamous Train Robber Black Jack Ketchum. Not only was he in the Hole In The Wall gang, but he gave the band their name and that’s his image on the cover. That’s a good story, but the title track – about his life – is a quite magnificent yarn. To be fair, there is nothing here that the phrase “quite magnificent” wouldn’t apply to. “Pave Your Way” has a nod to Kenny Rogers’ “The Gambler” in its words, but is entirely of this millennium, “Fumblin’ For Rhymes” is one of the few songs about being a musician that has anything new to say: (“I like what I am doing, singing songs and getting paid, wish it paid a little more, though”) and “Construction” adds a touch of funkiness to the awfulness of the evening commute. The last one, “Give A Damn” is classic singer/songwriter fare. Acoustic led, and reflective, but whilst it sounds like many, it copies none. “In a place like this, its easy not to give a damn….” Sings Ketchum and the message is clear. There’s not always light in the end of the tunnel. You just keep going. A record like this needs that too. The best stories are the darkest, the bleakest, but shot through with a stoic humour. In that respect, these songs are definitely the “Best Of The Worst Kind”.